Champions understand gratitude. Thanksgiving is a favorite holiday in these parts. Feasting with family and friends is ideal any time but the idea that people across the whole Nation are doing it at the same time seems to make it special. “It’s hard to say grace and sit in the place of someone missing at the table.” That is a line from a song that sums up the difficulties that arise when the first holiday rolls around after losing a loved one. Larry and Teresa Wrinkles and Lonnie and Vera Mears are experiencing the first Thanksgiving without Larry and Lonnie’s Mother, Esther Wrinkles. Irene Dooms is missing her sister and Ruby Proctor is missing her dear friend. That is the way it is for people everywhere. On the special feast days a moment apart to remember dear ones past is a moment well spent. Esther shared a pink Christmas cactus with a Champion friend, but it always starts blooming just before Thanksgiving. She was a Champion and Ruby is yet. Happy Thanksgiving. Patricia Metroplos has nice things to say about Myron Jackson and KZ88 radio out of Cabool. The station produced a memorial tribute to her son, Geoff. Her daughter, Joanne Metroplos, who lives in Seattle, contacted Jackson and made arrangements for the memorial to be presented on the first anniversary of the day her brother passed away, November 16, 2012. Family members and friends submitted their memories and thoughts about him which Jackson read, interspersed with Geoff’s favorite music. Pat was pleased with way it turned out and will be getting a CD of the program for a remembrance. Geoff had an eclectic appreciation of music. He played guitar for his own enjoyment. Champions remember him as a fun loving, hardworking, energetic man with a gravelly voice and a large skill set. He could do about anything. Had illness not already overtaken him, Geoff would have been the one to climb the tower when the radio station suffered storm damage last year and needed some maintenance. He was a fearless kind of guy, a fan of Community Radio and expanded thinking. Skyline School promotes expanded thinking. In addition to being the wonderful rural school that is shaping the future Champions of democracy, it provides some excellent community services. Secretary Helen Batten writes that the Douglas County Health Department comes to the school the first Tuesday of each month and has free screenings available to the public. She says they always do BMI, blood pressure and carbon monoxide. If they have the kits, they do sugar and cholesterol screenings but not every time. They are at the school from 8:30 until 11:00 in the cafeteria. Area residents appreciate access to these amenities. The little school is a treasure even for people who do not have children at home any more. Some of them will be looking forward to the school holiday programs just for the chance to see what the future holds in store and to remember their own long past youth. Mark Twain was born November 30, 1835. The many acres of National Forest that bear his name in this part the country keep him in mind as people drive almost anywhere through a spectacular countryside. He was born in Missouri and Champions are proud to call him one of our own. Champion is the kind of place where one can easily imagine Samuel Clemens standing around the stove spinning yarns, spreading news and philosophy all over the place the way Lee Ray, Elmer Banks and other prominent citizens do. What would he have to say about timber thieves winding their big old semi double clutching e-flat trailer trucks and monster tiger-cat dual arch grapple log skidders through his pristine, Federally protected woods to make off with 40 and 50 foot oak trees that clearly belong to someone else? There will doubtlessly be some lively discussion about the practice down at the Recreation of the Historic Emporium. They say the identity of the thieves will be disclosed when they are indicted. Champions will be watching the papers. Twain said those who do not read the newspaper are uninformed and those who do are misinformed. Who knows what he would have had to say about the World Wide Web and the mingling of real and unreal information in both venues? Words are important. Cold, wet weather might be making hunting season more memorable for some Champions. They will have stories to tell when their teeth stop chattering. Hopes are that all the wounded critters will be found out in the woods and that all the holiday travelers will safely reach their destinations. The Underhills of Champion South will host a grand banquet of unrelated people. Vivian Floyd will have the Krider bunch at her place again and young Drayson will be the center of attention for family who have not yet had the pleasure of meeting him. Some households will be singing together and dusty instruments will be coming out from under beds to get tuned up again after a long silence. They say that Dillon Watts is being conscientious about his banjo practice and playing and that he has potential to be very good. It looks like he is line for the musical talent of both his grandfathers. Perhaps his next trip over from Tennessee will find him playing with his late Granddad’s friend, Wayne Anderson. His great uncle, the General, met up with him at the store last spring and the lad was already showing great promise. It is reassuring to old folks when young folks like the old fashioned stuff that was new when they were the young ones. Tune into “Roots and Branches” on Thursday mornings, 10:00 a.m. to noon to enjoy some of the oldest and most obscure old time country, folk and bluegrass music that you will ever hear. Find a link to Listen Live KZ88.org on the website at www.championnews.us. Toes will be tapping. Send examples of expanded thinking, favorite tunes and reminiscences of old time Thanksgivings to Champion Items, Rt. 72 Box 367, Norwood, MO 65717 or to champion @ championnews.us. When the roads dry up and the sun comes out drive down to one of the world’s truly beautiful places. It is over the river and through the woods at the bottom of several hills, where the pavement ends and country roads converge on the wild, wide, wooly banks of Old Fox Creek—Champion! Looking on the Bright Side! The full moon in November is one of the sights that make the Ozarks in general, and Champion in particular, one of the loveliest places available to visit by land or sea. The moon comes up over a hill through the forest fringe of leafless trees while on the other side of the valley Venus gleams brilliantly. Hunters are hunkered down around camp fires, their Coleman lantern shining like beacons through the brush. Some of them will wake up stiff and sore in the morning and be glad to head down to the Historic Emporium for some coffee and a good warm up around the stove. They are some of Champion’s favorite visitors, wearing orange and driving slowly. They infuse the area with their currency and soak up some of the beauty of a placid rural reality. Then they drive off with the deer that would be eating the spring planting. Good luck! 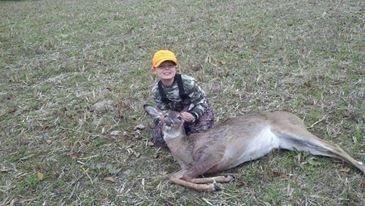 Foster had some good luck and shot his first deer on Saturday—a nice size doe. Among those who congratulated him online were Lucy Foster Miller, Dailey Upshaw, Sheila Marso Crewse, Beka Morrison, Bernice Wiseman, Kaye Johnson, Marlene Frazo, Anna Johnson, Wilma Ash, Ron Wiseman, Wilma Darlington, Gordon Watts (who said ‘Tell him I read about it in the paper all the way in Tennessee.”), Christy Berry, Jill Mallory Cline, Teahna Oglesby, and Larry A. Powell II. Of course there were numerous actual handshakes and pats on the back in Champion. His Mother said she was proud of him, but it makes her a little sad to see how fast he is growing up. His cousin, Drayson Cline, is soon to be three months old and Champions can easily remember when Foster was just that size. Time is fleet. Neighbors over in Illinois had some hard luck as tornadoes tore through the Midwest on Sunday. On Monday morning the news reported six fatalities in the area and a great number of injuries, plus the loss of many homes and businesses. Their Champion family and friends were glad to hear that Harley and Barbara Krider and their family were all safe there in Peoria. Hopefully, they will still be able to make the trip down to spend some time in their Champion home for Thanksgiving. They will have stories to tell and, like everyone here, plenty of reason to be grateful. This week’s birthday celebrations start out with Elva Ragland’s on the 19th. She is a live wire. She grew up around here, went to school in Champion married a rail road man and moved off to California for a long time. She has been home for a number of years now and her Champion friends are glad. The 20th was the birthday of David Lynn Hicks. He was born in 1956 and just passed away on November 10th this year. He was a musician with the sweet kind of music making smile that so many of those people carry with them. The 23rd is shared between Leland Trujillo, a kindergarten student in Skyline, and a happy Grandmother in Champion South. Her grandchildren are Seamus, Elizabeth, Zachary and Ethan. The woman sets the standard for how grandmothers are supposed to be. Waylin Moon is in the seventh grade at Skyline. His birthday is the 24th. Levi Hicks, fourth grader, celebrates on the 25th. Faith Crawford, in the first grade, and teacher Lannie Hinote both enjoy the day before Thanksgiving as their birthday this year. It is the 26th. Sometimes the whole Nation celebrates with them when their birthday is on Thursday. Uncle Al the Lonesome Plowboy sometimes had pumpkin pie instead of cake. His was the 27th. Ally Smith, second grade and Billy Strong in pre-kindergarten have the 29th. Kindergarten student Lane Watkins and third grader, John Rhodes both have the 30th as their special personal day. Let the joyful acknowledgments of having been being born commence! Linda’s Almanac from over at The Plant Place in Norwood says that the 21st and 22nd will be good days to apply organic fertilizer. The 23rd through the 27th will be good for destroying weeds. It is nice to have a guide, but gardeners mostly just do what comes next when they can get around to it. The Almanac has moved on the website at www.championnews.us to the very top of the page on the right hand side. It is handy and helpful. Find a copy of it on the bulletin board in Henson’s Downtown G & G on the North Side of the Square. Drop a note to Champion Items, Rt. 72 Box 367, Norwood, MO 65717 or to champion @ championnews.us with your research into truth, organic fertilizer, or why musicians are often such pleasant people. “When upon life’s billows you are tempest tossed, when you are discouraged, thinking all is lost, Count your many blessings…” That will be easy to do in Champion—Looking on the Bright Side! “In the Garden of Delight” was written by Lily Hardy Hammond in 1916. It looks like it will be a very interesting read. It is thought that this book is where the phrase ‘Pay it forward’ may have been coined. It is certainly a Champion notion. It is an old concept that goes back to Athens in 317 BC when it appeared in a play by Menander. Two thousand, one hundred and one years later on April 25, 1784, Ben Franklin described the idea in a letter saying, “It is a trick to do a deal of good with a little money.” Ralph Waldo Emerson wrote about it in an essay in 1841. Now it is showing up in The Champion News as Pete Proctor reports a lovely incident. He and Phyllis were in West Plains enjoying dinner the other day as a celebration of their first wedding anniversary when a man and his wife and daughter approached them and thanked Pete for serving our Country. The waitress stopped by later to tell Pete and Phyllis that their bill had been paid by the family who had just left the restaurant. Pete was touched. It is the kind of experience that Champions hope for all the Veterans and for all those serving currently at the behest of the Nation. They pay it forward in ways that cannot be imagined by to those who have them to thank for peace and freedom at home. Champion Veterans! What a treat it was to have Raymond and Esther Howard in Champion again. They visited with friends on Sunday and posed for a picture under the big walnut tree over by the church. Raymond is getting ready for his birthday next week. Thursday the 14th is the day and he will be 91 years old. Raymond and Esther Howard of Marshfield made a Sunday visit to Champion to attend church and to visit with longtime friends. Paul Morgan will be 83 on the 13th. Foster and Kalyssa’s Granddad, Wayne Wiseman, had his birthday last Thursday. He was 80. Raymond teases Wayne saying he is a week older because his birthday is first. Those guys have known each other for a long time. Raymond was pleased to see several big reds while he was visiting. He and Lonnie Krider used to hunt squirrels together. The conversations they had about it were certainly lively enough, it is a sure thing they enjoyed the hunt. It would be a fairly sure bet that if Howard is there, fun is afoot. It must have been fun for young Richard Heffern to get an early first birthday present in the form of a little brother. For a few days from the 8th to the 15th he and Robert are the same age and then Richard jumps forward for a year. Cake and ice cream for a week! Future ccustodians of democracy currently attending Skyline School will have birthday celebrations this week. First grader J.D. Borders celebrates on the 9th. Sherman Hall who is a sixth grader will have a great birthday this year. It is a special one–11/12/13! Raven Hull is in the second grade with a birthday on Saturday the 16th. More ice cream, please. Linda’s Almanac from over at The Plant Place in Norwood indicates that the 21st, 22nd and 30th will be ideal days to prune in order to encourage growth. Those will also be good days to apply organic fertilizer. By the time some old Champions get to that wonderful pile of old horse manure that is waiting for them over in Coonts holler it is liable to be frozen hard. The days just slip away. It seems that there is always something to do in the garden. Linda’s Dad, Chuck Barns, had his birthday on November 11, 1916. He passed away in 2002. He was a good story teller and a pretty interesting bridge player. He had an exciting life doing heavy construction and living all over the world. His garden experience included raising artichokes in Tasmania. Kaye Johnston and Fae Krider visited with Ruby Proctor in the Cabool Nursing Home the other day. Ruby moved there after a short stay in the hospital in Springfield. She was reported to be doing well and was in the sitting room when the sisters arrived. Pete indicated that she had a good week and she gave him a big smile when he visited. Ruby has one of those smiles that makes a person feel good without a word being said. Her Champion friends all wish her well. She, like many, is probably thinking about and missing her old friend Esther Wrinkles who passed away back in January. They grew up together in Champion and were baptized on the same day in Old Fox Creek when Ruby was seventeen. Browse through the Champion Snapshots section of the website www.championnews.us to see pictures of Ruby and Esther together. They are the very image of a lifelong Champion friendship. While out on that site look at The Dairymaid in Champion Connections to see Taegan (Peanut)’s trip to Tennessee. She had a good time and it looks as if she enjoys traveling. The Dairymaid does a great job of documenting the family. It is good to see photos of those cousins on their own turf, though they are always welcome in Champion. Technology used in this positive way can keep families close and informed about each other. Out in the big world technology often isolates people making them ‘alone together’, as everyone stares at a screen or device of some kind with no interaction among them. It is not that way in Champion. “We’ll not soon recover from the eventual earthly loss of people like you. Lord, delay that day.” This inscription on the back of a family photograph on loan from the Royce Henson family is a poignant thought. It brings to mind the notion that today is the day where living takes place. Champions do a good job of living in the present. They reference history for comparisons between past and present to conclude that some things are better today and some are not so much. The scientist and humorist, Steven Wright, says that a conclusion is the place where you got tired of thinking. He also says that experience is something you don’t get until just after you need it. Comparisons, conclusions and life experiences are welcome at Champion Items, Rt. 72 Box 367, Norwood, MO 65717 or at champion @ championnews.us. Bring them with you to discuss around the old stove in middle of the Recreation of the Historic Emporium over on the North Side of the Square. Sing, “We’ll meet again, don’t know where don’t know when, but I know we’ll meet again some sunny day” in Champion—Looking on the Bright Side! Some would say that the autumn colors have ‘peaked’ in Champion and in the area overall. There is more uniform brown as the various oaks russet together. Then right between an old cedar and a fresh pine dazzles out something brilliant apricot gold and there are the dogwoods, glorious in every season. It all changes second to second with fluctuations of the light. It is difficult to keep an eye on the road for looking at the forest. Bud Hutchison and a bunch of his friends were horsing around on old Ivy Lane on Saturday. They have the right idea about how to enjoy this extraordinary part of the world. They are right out in it quiet, slow and easy. The horses seem willing to accommodate motorized traffic but they probably like the road all to themselves. Anyway a person gets to Champion is a good one. Royce Henson’s birthday caravan came rolling into town mid-morning on Saturday and toured the Recreation of the Historic Emporium over on the North Side of the Square. There were twenty some odd of them who gathered in the old Champion School house for stories of the bygone days, for a look at some great family photos that Jo had sent in advance, and for some new family photos. Royce said that as a kid in school he would never have imagined that the old building would ever have electric lights and gas heat. Everything was lit with or run on kerosene in those days and the school house was heated by a big wood stove. In the days before insulation, the children probably dressed warmly and they almost certainly burned a lot of wood in that stove to keep the two rooms comfortable. 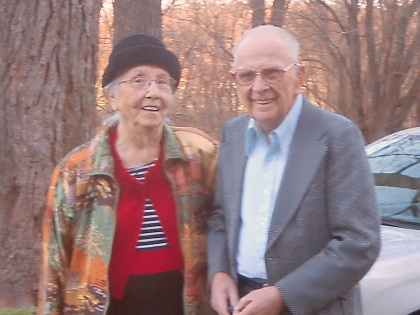 Eva Henson Phillips and her husband Harold Phillips came up from Bella Vista, Arkansas to help her brother celebrate his 80th trip around the sun. Eva has her own set of memories of the school. The caravan rolled out in time to make its luncheon reservation at Rockbridge and reports are that the day was a great success. Champion! Skyline School Counselor Joy Beeler had a birthday November 3rd. She shares the day with Kellie Perryman, second grader. That is also the birthday of young William Litchfield. He was eight on Sunday. Another second grader, Hailey Hall had her day on Monday the 4th. Miss Emerson Rose Oglesby has her special day on the 5th. Then her truly great aunt Sharon Upshaw will celebrate on the 6th. The General will not miss this one. Linda and Charlene over at The Plant Place in Norwood will help their sister, Kathy, celebrate on the 6th. They will probably play cards. Mason Solomon who is a kindergarten student at Skyline has his birthday on the 7th. 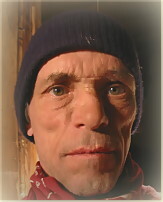 Woodworker extraordinaire, Bob Underhill from Champion South was born in 1946 and so finally is as old as some of his friends. Not everyone likes to have his picture taken or to have his birthday celebrated. Those folks get celebrated on the sly by people who love them. It shows up in a smile or a hug. For those who do very much like birthdays, Rock On! 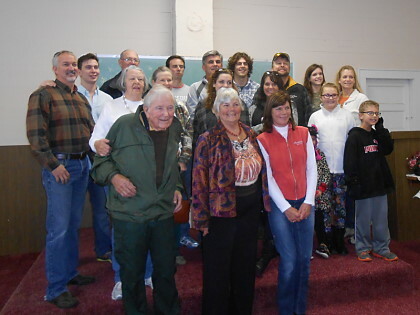 The Eastern Douglas County Volunteer Fire Department had a great chili supper Saturday night. The food was very good. Backyard Bluegrass was up to their usual standard of great. A critic would say, “Wonderful fiddle, banjo, mandolin, guitar and bass and wonderful harmonies!” Sherry Lynch’s husband got up and did his version of the “Hillbilly Auctioneer” which was quite a crowd pleaser. The next thing you know he was up there doing the job. He makes it a lot of fun and is very clever about eliciting that next bid. The business community together with the fire department membership and friends donated some great items that went up on the block. These little rural fire departments are what keep country people safe! It is good to see the community come out to support them. The General is in a quandary. At the chili supper the other night he was invited to attend a poetry reading –a night of poetry and quiet jazz with some chilled white wine and brie-casual attire and an incitement to participate. At this his heart fairly leapt! At last! The General has spent many a mile solitarily in his truck reciting Henry Wadsworth Longfellow’s, “The Arrow and the Song.” Many are familiar with the opening line, “I shot an arrow in the air…” Crude parodies aside, the sweet sentiment is not likely to be elocuted by himself as the salon is to be held on Super Bowl Sunday. It must be a chore to be a Renaissance man. Go to the website at www.championnews.us to read a copy of the poem. It expresses well the Champion ideal. Many Champions have their archery farm tags. At the price of bullets these days bagging the turkey or the deer with an arrow seems somehow more economical. That may not be the case. The Skyline School has a good archery program and a great place to practice. Mountain Grove students have had a successful archery program, but budget cuts are causing the school to consider doing away with it. Some parents are getting together to have a benefit to help preserve the program on Thursday, Friday and Saturday at the Saddle Club Building at the Fairgrounds. They will get started at 8 in the morning. It looks like there will be something for everyone with a bake sale, chili, and a large multi-family yard sale. The proceeds will support the archery program that serves kids who might not be football players, who might even be girls who do not play basketball. It is good to see every child get a chance to participate in sports. Softball was the big school sport in Champion as many an old timer will tell you. Some of them will be shooting their arrow of good wishes that way. At any given moment Champions know people who are ailing. Ruby Proctor is reported to not be doing well these days. Russell Upshaw is improving. Toby Mastin is hanging in there. Richard and Kaye have had a bug and many others may be suffering in ways that may not be apparent. When people we love are unwell or hurting, it is in our hearts that our thoughts and prayers would wrap around them, comfort and support them and make them and all those who love them feel better. It is a Champion effort. As the swallows return to Capistrano, so do the turkey vultures to Champion. They have been around, but this time of the year it seems they are legion in their coming and going. A prominent Champion was entering the Emporium the other day just as another such was trying to leave. Each had a hand on the door knob with the door in between. They got to pulling and pushing until the door was about to bend, “Betty!” says he, “There’s a big wind about to bend your door!” It turns out the wind was on both sides. Send your own such charming antidotes or buzzard stories to champion @ championnew.us or to Champion Items, Rt. 72, Box 367, Norwood, MO 65717. Come down to the bottom of several hills where country roads meet on the wild and wooly banks of Old Fox Creek to one of the world’s truly beautiful places and enjoy the sites. Champion! Looking on the Bright Side!